If anyone recognises Maggie Milne or has any information to add please do so via the Contact pageThe article on Rev William Murray by kind permission of Mr Fraser Mitchell, Strichen. The article on Alexander Urquhart by kind permission of Kathie Hilditch (nee Urquhart) Many thanks to Charles Sandbach , military historian and private collector, from the North West of England for the story on James Shand. 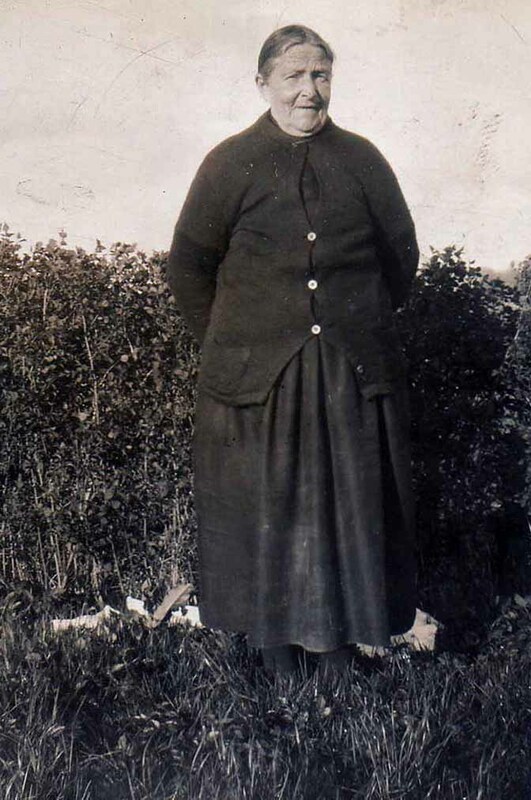 The article on the New Pitsligo sisters by kind permision of Mrs Gladys Sinclair New Pitsligo The very last set of photographs and story was by Sandra Jean Hawkins nee Norrie. 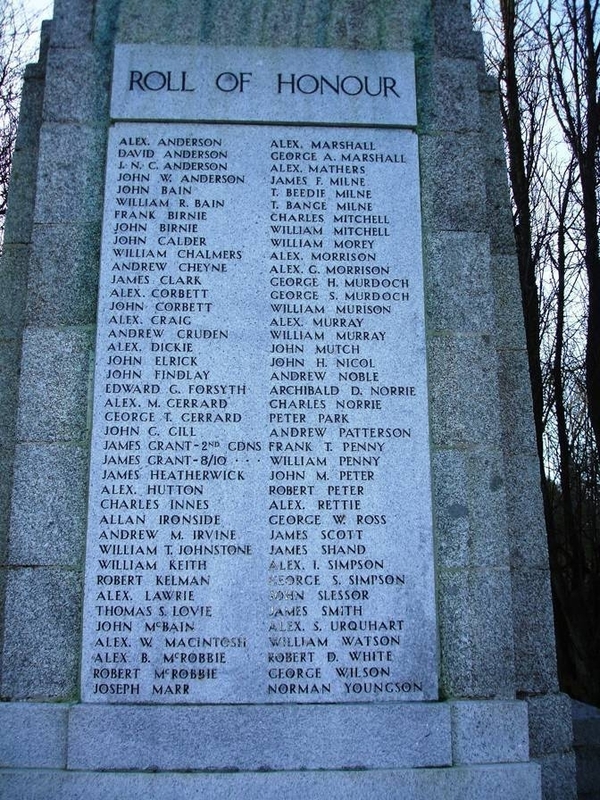 Was the youngest of 10 children all born in New Pitsligo between 1864=1883? and it is thought she was also a teacher of lace making in New Pitsligo. 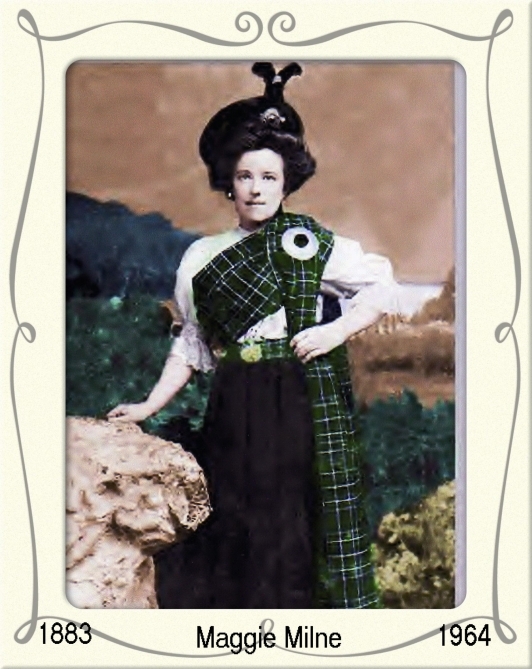 met her husband Thomas Milne, she married in 1913 in Glasgow..
in 1887 and her mother died in 1888 both in New Pitsligo. The only time there is no trace of Maggie is in 1901 census, where. Could she have been then??. There is so much info to find and sadly no one left alive to tell it. i have attached a photo which has been restored. 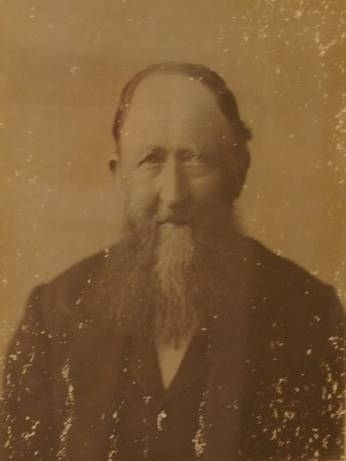 William Murray was born at Whitehill New Deer on the 26th June 1837. He was the youngest of six children, his parents were John Murray a native of New Pitsligo and Isobel Sheron who came from Whitehill. When William was three years old his mother Isobel died and the family moved back to New Pitsligo with their father taking on the lease of "Scarehill Croft" near the village. The family grew up on the banks of the river Ugie their father scratching out a living as a crofter and shoemaker. William attended school in the village, a track which cuts through the moss from Scarehill was a shortcut to the village and on his way there he would have passed the stone quarries and seen and heard the masons who were already hard at work. By all accounts William did well at School and from an early age he was interested in stories of "Darkest Africa" little did he know that the stories would one day turn to reality. As a young man he was a member of the Congregational Church of Scotland with further learning in Aberdeen and with the help of The London Missionary Society he graduated in Medicine and Theology. The London based Mission was not tied to any particular body but sponsored the overseas work of Missionaries from many different Churches. William studied at Bedford and Highgate London before being ordained in July 1861. He was married on the 20th April 1861 to Anne Elliott of Highgate and their daughter Isabella was born on the first day of February the following year. In July 1862 he was informed that his first charge would be working with the Griqua people in Kwa-Zulu Natal part of the Cape Colony in South Africa. Testimony to this can be read on the reverse side of his fathers headstone in Turlundie Kirkyard. 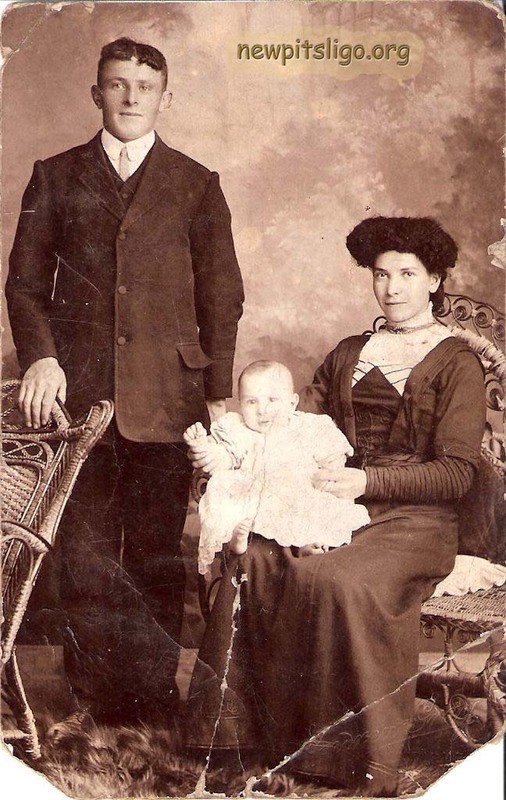 William Murray his wife Anne and baby Isabella left Southampton for "Darkest Africa" aboard a steamship of the Union Line, the company had only started with steamboats a couple of years before and had shortened the trip to 32 days though still an exhausting journey. On August 20th they arrived safely in Port Elizabeth then on to Grahamstown by Post Coach and from there by Ox Wagon to Queenstown. One night in September 1862 the travellers were caught in heavy snow and rainfall while crossing the Gatberg pass in the mountains not far from Hackney. Mrs Murray and little Isabella both contracted pnuemonia and shortly after arriving at their destination baby Isabella died and Mrs Murray the following day. It was a tragic blow for the young Scot he was devastated homesick and lonely left solely with his faith. The few friends he had met persuaded him to stay. They told him they would build a house for him the walls would be made from mud and the roof would be covered with Tamboeckie grass from the riverbanks. True to their word the Griqua's built him a house, shortly afterwards a white man Henry Dugmore a trader also built a house next to the Misssionary . When he arrived William was living in poverty Dugmore helped the young Scot who was still only 25 years old and the two became firm friends. When William's house was being built he planted several oak seeds taken from the banks of the river Ugie at Tillinamolt the tree's blossomed and were still there at a remembrance service in 1965. During the Mopondomise Wars both houses were burned down the two men just escaping with their lives. In 1874 things began to flourish with the village's first store being opened. More white people arrived Dutch German and British settled in the area and William opened a school for the children of the traders and farmers. In 1879 it became a state School and employed it's first teacher a Mrs Margaret Allen. The young Scot helped the Griqua's in any way he could.. he would teach their children, he would treat them when they were sick and for their spiritual needs he would be with them. For these selfless acts of caring he was given the honour of naming the new village, this he did by naming it "Ugie" as it reminded him so much of home. 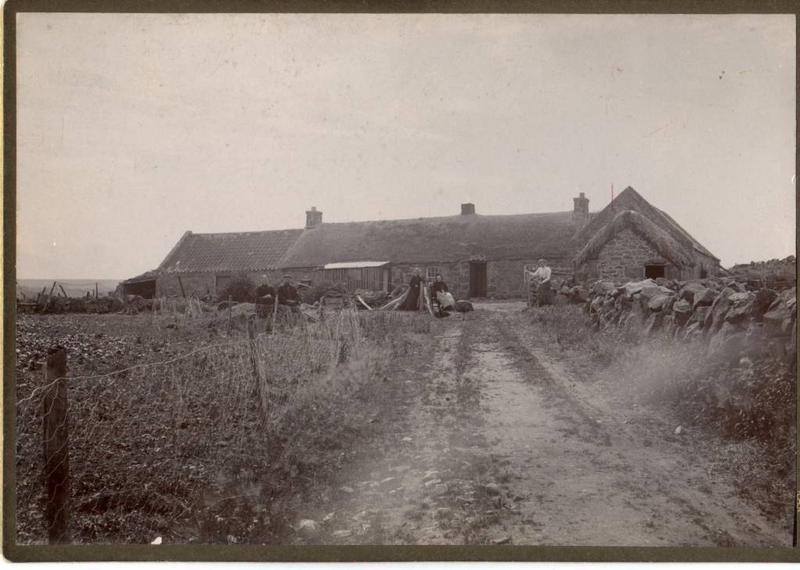 In 1878 William returned to New Pitsligo to visit his father John Murray who was still living at Scarehill he was now almost ninety years of age. William had been away for sixteen years. His stay in Scotland was all to brief as he bode his family farewell he knew in his heart he would not see them or his beloved Scarehill again. He returned to the Cape and a new challenge in the town of Kokstad just north of Ugie though still working with the Griqua people. Early in the 1890s he was also working with his close friend The Rev. William Dower who came from Banchory and was invited to became Principal teacher of the Griqua School. After a successful few years he succeeded the Rev. Dower and became Pastor of the Griqua Church in Kokstad and incredibly a portrait of the Rev. Murray still hangs in the Church to this day. In 1889 he married for the second time to Anne Johnston a Griqua girl. Anne and her family had looked after William for several years after the tragic loss of his family. There were no children from this marriage. William Murray died on the 15th of October 1906 at Kokstad and that is where he is buried. A beautiful stone Memorial was erected by friends and in 1916 his wife Anne also died and she is buried beside him. He was a good man and Kokstad and Ugie are all the poorer for his loss. He was everyone's friend you could not help admiring the man. He did not work for human glory, his heart was above the things of the earth, I have met him on the lonely road on a dark stormy night when other men were asleep, coming from the cradle of a new born babe or from beside the bed of some poor Griqua boy. I have met him in the rain carrying medicine to the bedside of a Catholic girl who could not afford to pay for a Doctor. The man's heart was to large for narrow minded feeling. When he came into contact with human suffering he did not stop to think what creed or class they belonged, but like a true man he knelt down by the sufferers side and did what he could for his fellow men and God will reward him for his disinterested charity. A Medical Missionary for 42 Years in The Cape Colony. "A Faithful Servant To God"
"Until The Day Dawns And The Shadows Flee Away"
Just to let you know where "Scarehill" was...your coming from Middlemuir towards Craigmaud you pass the end of the Skelmonae road on your right... on the left is "Middlemuir Croft" and then still on the left marked by a solitary tree in the middle of a field..that is the spot where "Scarehill" stood. Stories and photos by Kathie Hilditch, Australia. My great grandfather lived in Bonnykelly and around 1910 his croft, etc was purchased by the Fraserburgh Council to build the Bonnykelly Dam. My great grandparents decided to emigrate to Canada and most of the family went with them. My grandfather didn't as he was married with a family of his own at this time and was actually living in Aberdeen and working on the trawlers out of Aberdeen. I was able to visit Canada a few years ago and met up with relatives I didn't know I had. Quite an experience. 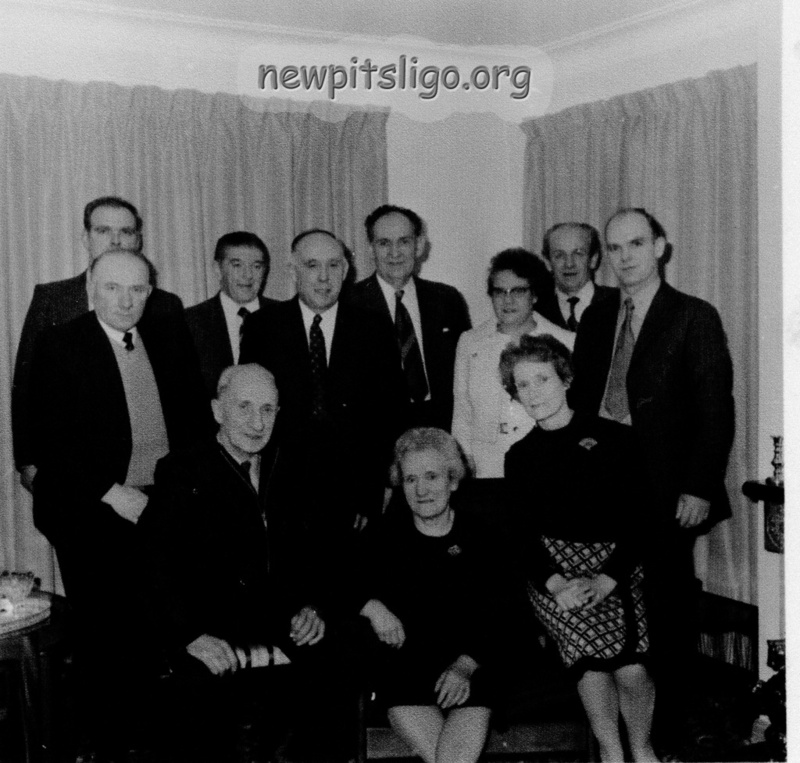 My grandfather attended Bonnykelly School in his early years and was a school mate of Rob Chalmers. When the Germans started to bomb Aberdeen in late 1942, it was decided that my grandparents, my mother, brother and I move to New Pitsligo. My grandfather was injured at work and my mum had to carry him up and down the tenement stairs to the Anderson Shelter in the event of a bombing raid. The move was made to New Pitsligo and we lived at 144 High Street, next to Rob Chalmers, who owned the house, and he rented the property to us for what I believe was 2/6 per week. My grandfather died about 8 or 9 months after the move and I expect is buried in the local churchyard. His name is Charles McGhie Ingram. My father was also a verger at St John's for a time but I am very uncertain what the dates are or how long he was the verger. The minister at the time was Reverend Gunn. The organ player at the church, Peter Grey, was known to my mum as she was friendly with his house keeper. Although he was blind Peter had a beautiful touch and played so well. It is some 55 years since we left the village but I do have some very fond memories of my time there. I will try and get the old grey cells working better and try and come up with some more stories of New Pitsligo - which hopefully will be of use to someone else viewing your website. 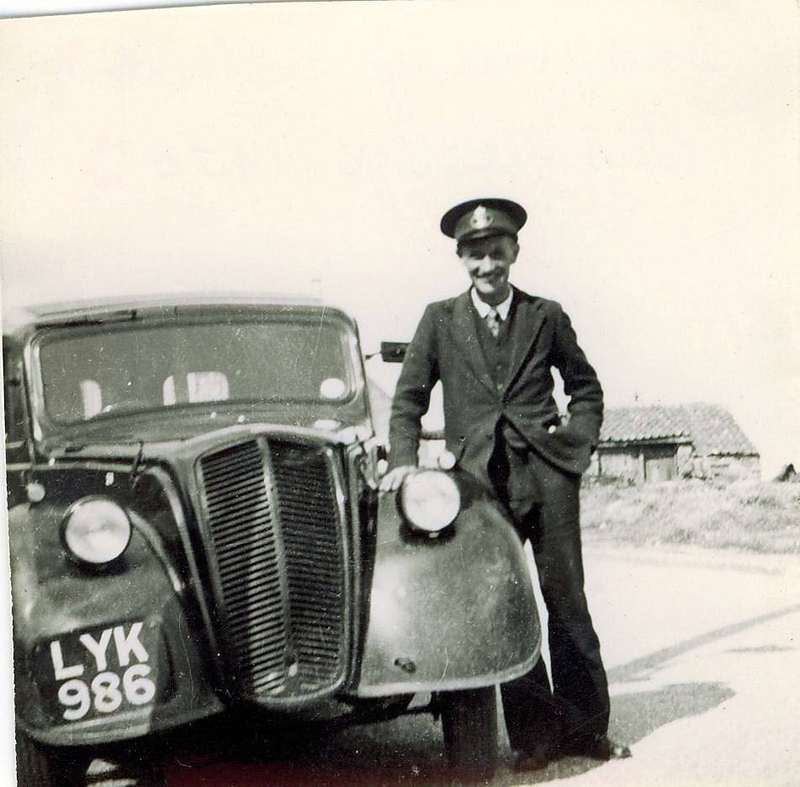 My dad, Alexander (aka Alick) Urquhart, was one of the postman servicing New Pitsligo and the surrounding farms. He started work as a part time postman c1946 and then was given the position full time shortly after. He resigned early 1953 when he decided to re-enlist in the army. During his time with the Post Office he was never fitter. This was because during the blizzards in winter the mail still had to get through and he would park the van somewhere and walk to most of the outlying farms to deliver the mail. He was always well received and was very often given a toddy of scotch to help him survive the cold. He would also come home with small gifts from grateful farmers, ie eggs, cabbages and various vegetables. Along with my dad, I remember there was also a William (akaWullie) Urquhart who was a postman at the same time as my dad. As far as I can gather Wullie was not related to us but you never can tell what with all the information available to researchers these days. as told by Charles Sandbach, military historian and private collector. This is the story of one of the men who died during the First World War, His name was James Shand. James was born on the 28th. March 1897 in Aberdeen. He was the son of Andrew Phillip Shand and Jeannie (Jane) Shand (nee. Scott). It is very likely that he was born at the family home, 56 Baker Street, Aberdeen. When James was just a very small boy the family had moved to New Pitsligo, On the 1901 census they are listed as living at 99 High Street. Sometime later they moved the short distance to 9 School Street. James' father Andrew was employed as a stonemason. James was a very early volunteer, he enlisted for service in 1914 at just seventeen years of age, it is not clear if he lied about his age but his original service number 1856 shows that he was very keen to join the colours at the outbreak of war. James enlisted into 'A' - (Strichen) Company of the 1/5 Gordon Highlanders (Territorial Force). He did not embark for France on the original draft in May of 1915, maybe he would have been considered too young at just eighteen years and two months. He eventually arrived in France in December 1915, still only eighteen years old. The Gordon Highlanders were part of the most feared British Army Division, the 51st Highland. James would have played his part in the bitter fighting at the Somme in 1916 and Arras in 1917. I am certain his MM award came for his actions close to the Chemical Works at Roeux, about six miles east of Arras. James was already a Lance Corporal by the age of 20 holding the responsible position of deputy section commander, a dangerous and hazardous infantry rank, he would have 'flanked' his men, the German machine gunners targeted the junior NCO's on the wide flanks during line attacks. What is certain is that James was a very brave young man, he lost his life towards the end of the second battle of the Marne near Rheims in France on July 29 1918, he was just 21 years old. This was the last major German offensive of the war, had James survived those last few days of that bloody battle I am sure he would have lived to see the war end. This fine young man doesn't have a grave, his body could not be recovered from the battlefield where he still lies. I am so very proud to be the 'custodian' of his gallantry award the Military Medal. I have nothing in common with James, I am a 42- year old Englishman who has never served in the Army. I am however a very active campaigner for forgotten soldiers of World War One and I have been involved in many campaigns to preserve their memories. I have a small collection of similar medals to young men who never came home, I treasure them and wherever possible help to raise the profile of the men in their home communities. I am the guardian of their memories. I know you will be so proud of James, he is one of yours. James had five brothers, Thomas (Kens' dad), John, Alexander, Mitchell and William (died in infancy) and two sisters, Maggie (a.k.a- Daisy) and Agnes (died in infancy). Like his father he was a stonemason (albeit a young one). His dad Andrew Philip was very well respected as a master stonemason, the family are listed at residing at 9 School Street but actually moved next door to No.7 where the land could accommodate all the necessary working tools and outbuildings, the house still stands today. The Shand family were pillars of the community in New Pitsligo, however I believe that none of their descendents live there today. John Shand (James' brother) became a church minister having gained an MA degree. He travelled Africa and became very well known, he was indeed a personal friend of Archbishop Desmond Tutu, at some stage he was offered an Archbishop's role in South Africa but turned it down believing the role should go to an indigenous member of the population, that man I believe was Archbishop Tutu. Andrew Philip the father lived a long and fruitful life outliving his wife Jane (Jeannie) by a number of years, he died in the 1950's. Back in 1914 it was Andrew who accompanied young James to the recruitment office, he would obviously have been aware at the time that his son was a mere seventeen years of age. In a conversation with Ken many years ago the Rev. John Shand recalled that fateful day. He told of the Gordon Highlanders marching through the village in full uniform obviously on their way to the train station heading for England on their way to war. Rather poignantly John commented that he felt a certain sense of sadness as he was aware that many of the marching men would never return home. It seems likely the events of that day inspired James to join up, with the approval of his father. Surrounded by customers and friends are Mrs Ina Wallace (68) (centre) and Miss Annie Fraser ( 58) (right) whose family owned the Pitsligo Arms Hotel, New Pitsligo for about 55 years. To mark their retirement from the hotel trade, the sisters were presented with a cocktail cabinet, set of crystals and a tray in their home at Church Street, New Pitsligo. Mrs Wallace and Miss Fraser inherited the hotel when their mother died in 1964. And running it has been a real family affair. Mrs Wallace was in charge of the cooking, and Miss Fraser, a teacher at New Pitsligo School, spent most of her spare time helping out. Mrs Wallace's daughter Gladys, has worked full time in the hotel for about 12 years looking after the bar side of the business, while her son Fraser also helped out during his free time. In May of 1861, a weaver, George Norrie, born in Millbrek, died of scarlet fever at the age of 24 in his cottage in the Cowgate, Old Meldrum. 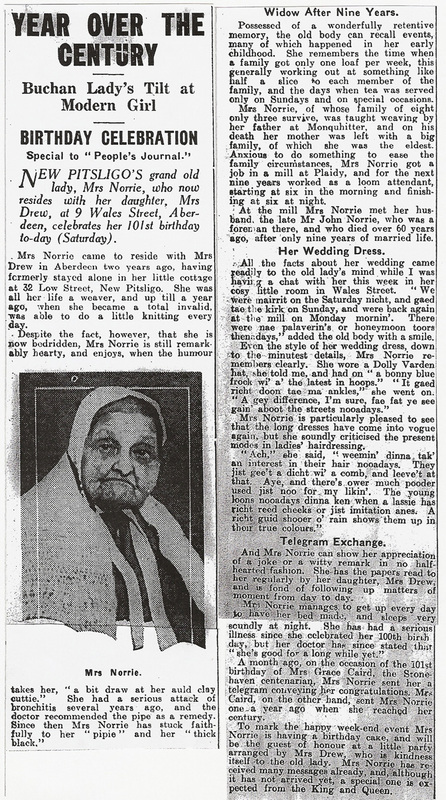 After just less than eight years, he left behind a 30-year old widow, Ann Joss Norrie (nee Duncan) from Monquhitter, also a linen weaver, and a family of two daughters and two sons. His widow was expecting their third son at the time. All his children had been born in Old Meldrum except for their youngest son at the time, George Norrie, who had been born in Plaidy, near Turriff. Ann had moved to 43 Low St. by 1904 and finally died at the age of 101, having lived with her daughter, Mrs Drew, at 9 Wales Street in the city of Aberdeen. Young George (22/8/1857 – 16/9/1925) was soon employed as a farm servant. At the age of 24 he was working in Fisherbriggs and he also worked for James Laing, farming 150 acres in the parish of Tyrie. Just before his thirtieth birthday, he married Ann Murray Knox, a domestic servant and lace maker, who stayed at 60 Low Street, New Pitsligo, with her grandmother and siblings. By 1891 George was to be found at 60 Low Street, New Pitsligo and then at 32 Low Street by 1905. George fathered four daughters and three sons, one of whom was John (Jake) Knox Norrie who married Williamina Rattray and whose photograph is already on the New Pitsligo website. 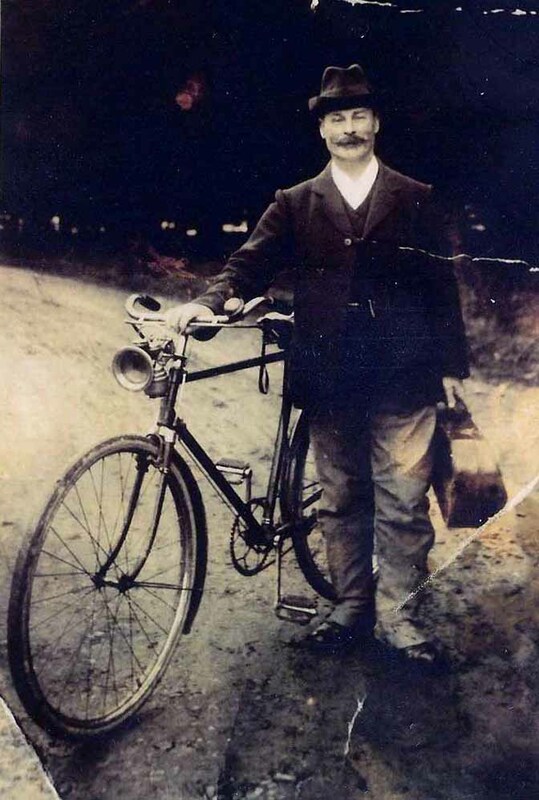 From Spring until Autumn, George left home and toured the whole of Buchan each year on his bicycle, booking local halls and barns in which to teach the elements of country and ballroom dancing. He is reputed to have reached Boat of Garten on these tours and was always accompanied by his William McHardy violin of 1842. He often played “Pop Goes the Weasel” for the junior dancers, dancing all the while himself, to demonstrate the steps. Many an errant dancer would receive a whack on the legs with the fiddle bow, if the steps were wrong. He started the famous Highland Dancer, Bobby Watson, and probably many others, on their dancing careers. He frequently judged Highland Dancing as well as ballroom competitions at local shows in the Buchan area. George was also a conjuror, juggler and ventriloquist. One of his dummies was “Mr Gingerbread”. In the Winter, George worked in Morton’s Canning Factory (now Rosemount Square) in Aberdeen city, staying with his daughter Mrs. Annie Knox in Rosemount Viaduct, Aberdeen. While staying there, George attended Donald’s Dancing School in order to learn the latest ballroom dances and keep himself up to date. Clearly, his wife led a solitary existence, having only one grandchild staying with her. He helped her keep the one cow as well as driving peats home with their pony and cart. George died, aged 68, at 59 Low St. New Pitsligo, of acute suffocative Pulmonary Oedema. Ann died ten years after George, of a cerebral Haemorrhage. 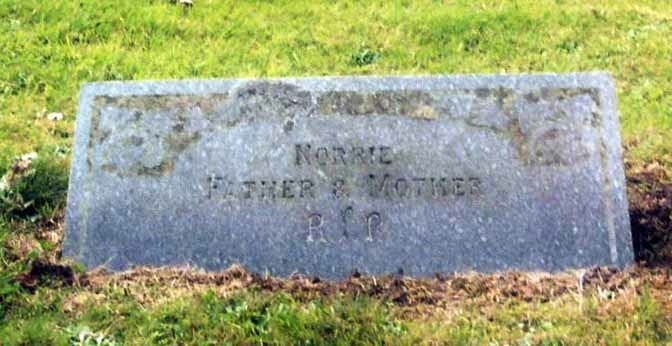 He and his wife are buried in Turlundie Churchyard at a rectangular tablet inscribed "Norrie Father & Mother". George Norrie ready to tour Buchan. Note the violin case and gas headlamp! I was born in Fraserburgh during the harsh winter of 1947 and lived at 126 High Street, New Pitsligo (Bill & Helen Much live there now) until I was 5 years old. 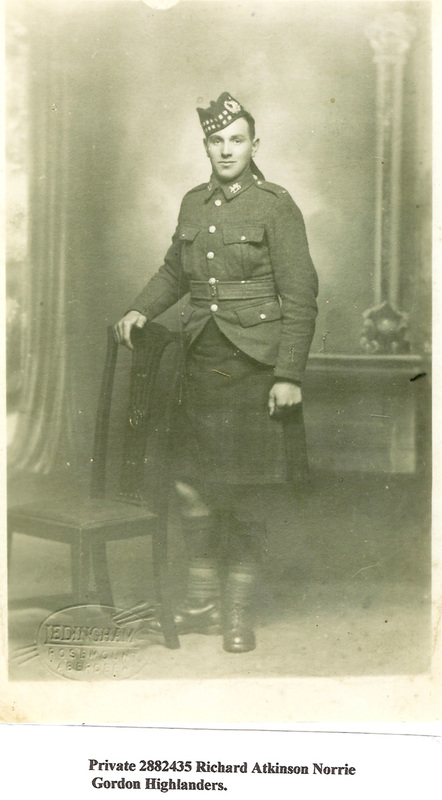 My father, Richard Atkinson Norrie, was a Mason journeyman and served in the Gordon Highlanders during the 2nd World War but spent over 5 years in Germany as a POW. He married my English mother on demobilisation. In 1952 we moved to Derbyshire where dad could earn more as a coal miner. 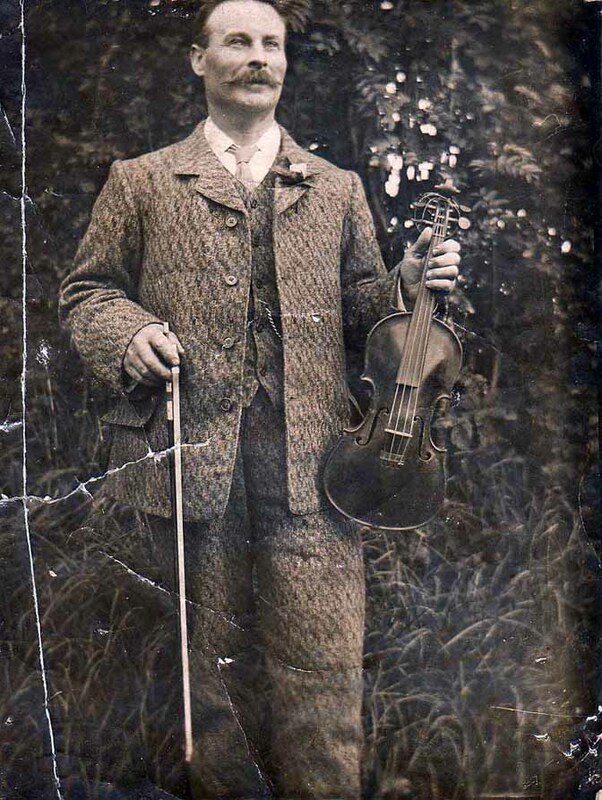 You already have on the site a photo of my grandparents John Knox Norrie with granny Willamina nee Rattray and his father George 'Dancie' Norrie with his fiddle and a story of his life. 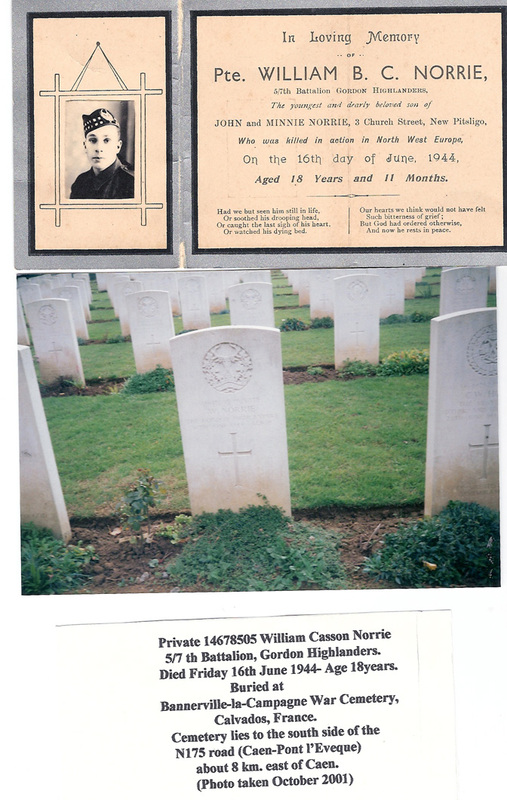 I enclose a newspaper cutting of 'Dancie's' mother Annie Norrie nee Duncan who lived for most of her 101 years at New Pitsligo and a photo of my father in his Gordon uniform and his brother William, known as Cassie who was killed in action in 1944. It would be of great interest if anyone knowing the family could contact me.